White Mountain Regional Center's Laboratory is a full service laboratory using state-of-the-art laboratory technology to provide accurate, complete and timely results to our physicians and patients. White Mountain Regional Medical Center's Laboratory is under the direction of a Board Certified Pathologist and is staffed by nationally certified Medical Technologists, Technicians, Lab Assistants and Phlebotomists. White Mountain Regional Medical's Laboratory is certified under the Clinical Laboratory Improvement Act (CLIA). 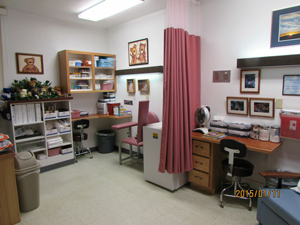 WMRMC Laboratory also provides pre-employment Urine Drug Screening and collection for local companies and contractors. Although WMRMC's Laboratory performs many tests on site, testing that is not done here is collected and forwarded to a reference laboratory. Laboratory Services are provided to the Emergency Department and inpatients 24 hours a day, seven days a week and serves outpatients from 7 a.m. to 5 p.m. on weekdays and Saturday mornings, from 8 a.m. until noon. For more information on the services offered in the Laboratory please call Outpatient Registration at (928) 333-7132.